Now that the meat has marinated overnight (or at least 4 hours) in the fridge, it is cured and ready to be dried! 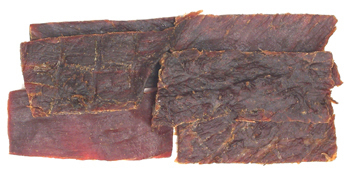 When drying jerky, it is important to know that you must avoid too much heat; otherwise, your Jerky will be hard and tough like shoe leather ... my advice is not to exceed 100 degrees Fahrenheit (or 40 degrees Celsius) when drying the meat. 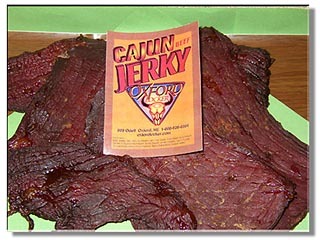 Basic rule: the slower and the more gentle the drying process, the softer your Jerky will be! This may be the original way the native americans used to dry their meat: rub the meat with a few spices and berries and hang the meat over an open fire or in the warm air to let it Air-dry - this may take several days and is definitely not be the most sanitary way of drying your jerky - since bugs and flies will crawl on the meat ... not really recommended. A very convenient, fast and widely used way is to dry the meat using a dehydrator device - there are many brands available, but all work with the same principle: a heating unit produces warm air that is flowing through several trays and is slowly drying the meat. 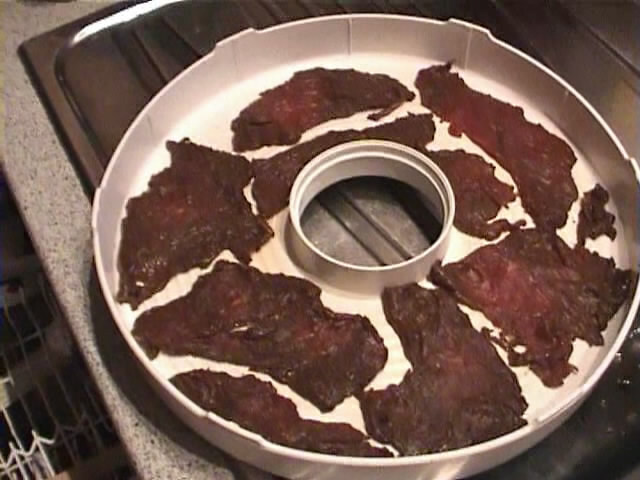 I really recommend this way to make your Jerky, so I will go into detail how to dry the meat with a dehydrator below! If you don´t want to get a dehydrator, you can also use your oven to dry the meat: setyou oven to 100 degrees F (or 40 C), put the strips on a rack in the middle of the oven, use a fork so the oven door stays open just a slit, and if you have turn the convection (fan) on so the air will circulate inside the oven. Since the meat strips may drip at the beginning, use aluminium foil to cover the bottom of the oven. Please be aware that a large oven may be not very accurate in keeping the temperature when working at low temperatures - so please check the strips from time to time to avoid too much heat! My first try with oven-drying was disastrous! A very cheap and at the same time gentle and energy saving way to dry your jerky is a Biltong Box (Biltong is the african version of Jerky). This device only uses a stardard 60 watts light bulb as a heating device. The downside of the Biltong Box is that it takes seveal days to dry the meat. You can use plywood (wallboard) or even a simple cardboard box to build a Biltong Box. 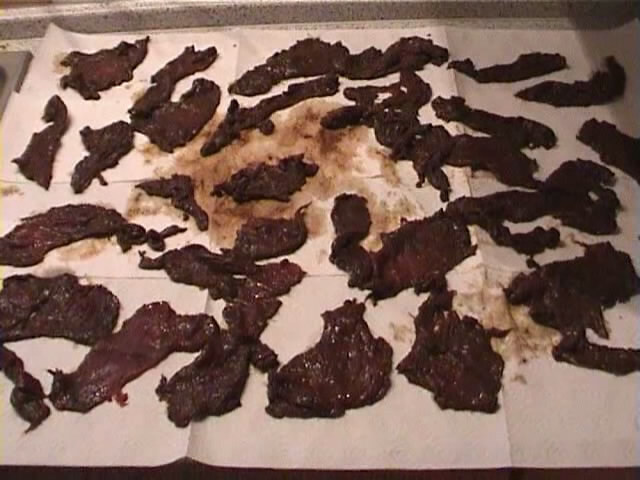 Yes, unbelievable but true, some guy from the US told me that he used to dry his Jerky in the fridge - he took a used frdige, put an old ventilator inside and opened the door a little bit ... takes several days, but since no heat is involved, you don´t have any bacteria and wthe resulting jerky must be very tender .. .I may try that some time! 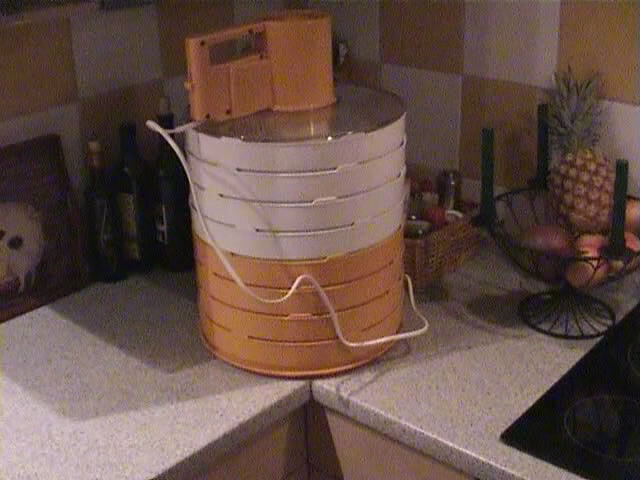 I´m using a tray-type dehydrator which is a bit more convenient when it some to meat drying than those expensive sieve type units... the marinade drying in the sieves really makes them very hard to clean afterwards... I upgraded my dehydrator unit to the maximum of 8 trays so I can dry approx. 4 pounds of meat in one go. Important: never ever reuse the marinade! It may be a shame to pour away the expensive stuff but because of a possible bacteria contamination you should never do this! You´ll see that the strips now have the brown color of the marinade - there might be some strips that have reddish patches, because the strips where sticking together onside the bag, but don´t worry, you´ll get the full taste anyway! red patches that look "unmarinaded" can be ignored. Now take another paper towel an dab off the strips to make the meat as dry as possible. Use a bit of pressure, that helps! The drier the strips, the faster the drying! It would be a waste of time and energy to put soaking wet strips into the dehydrator. Apply pressure on the strips to get them as dry as possible ! Now place the strips equally into the dehydrator trays, make sure that they do not overlap! As soon as all the trays are filled, the dehydrating process can start. Depending on the power of your dehydrator unit and the thickness of your strips, the drying process will take between 6 and 12 hours. 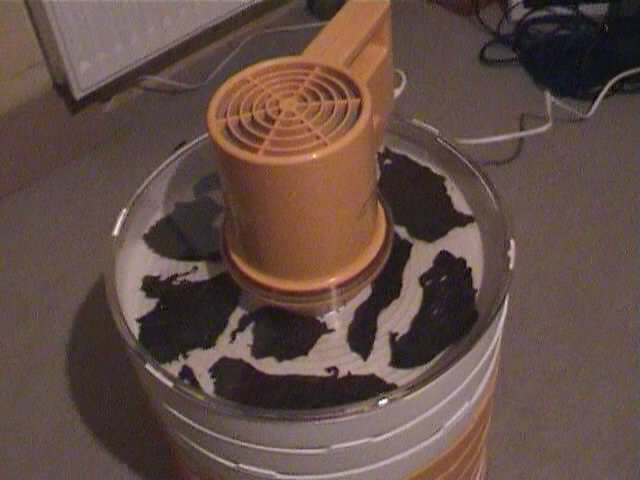 Drying meat is quite smelly, be sure to put the dehydrator in a seperate room where you can open a window. If your dehydrator offers several power levels (normally 3), do not select the highest power setting, but rather the medium or low setting, to avoid too much heat. Consult your manual. Especially if you´re new to Jerky making, keep an eye on the drying procedure and check the meat regularely, at the end of the drying process it is a good idea to check every 30 minutes! If you have a dehydrator with plastic trays (like the one I show you here), you may want to turn-over the strips after 4 hours of drying time, because the strips will dry on the upper side, first, but you want them to dry evenly. The jerky is ready when you don´t feel and soft patches on the strips when you npush with your fingers on it - they must be dry, but they should not break when you bend them - then the jerky is too dry! Check smaller or thinner pieces regularely and take them out of the dehydrator when they are ready. Dry your meat in a seperate room (basement) where you can open a window! Now the jerky should set - at least 2 days, better 2 weeks in the closed ziplock bag. Why? 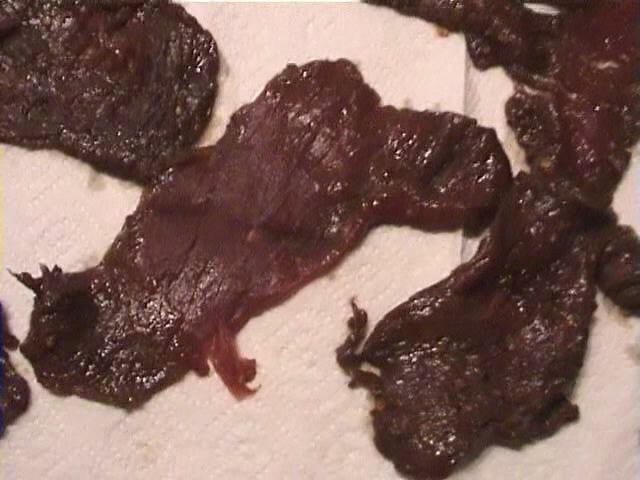 Well in my 3 years of jerky making I found that directly after drying the jerky is very brittle and does not have the optimum taste. After a few days it gets better, but the full taste and tenderness will appear only after you wait a little longer. I found that this waiting period also helps re-moisturize pieces what have become too dry. 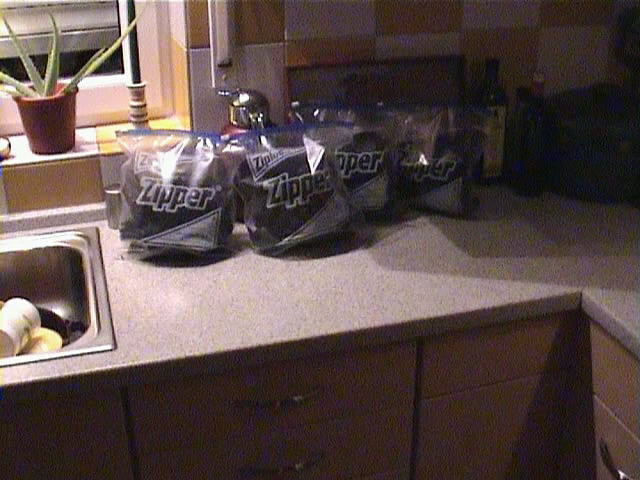 You can store your Jerky in a closed ziplock bag at least 4 to 6 months at room temperature. 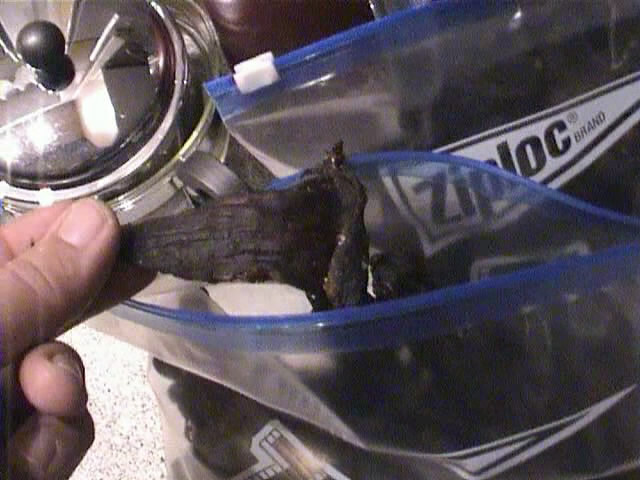 If the bag is open, the Jerky will continue to dry, or (if you live in a very humid climate) may even start to mold. It is really recommended to keep it in a closed or sealed bag. By the way: You may happen to discover a white coating on some strips after 2 or more months...99 percent of the time, this is NOT mold, but rather, salt that has crystallized on the surface. Now I’m done with my step-by-step Beef Jerky guide. I hope you had a little fun. If you decide to try my recipe, please tell me how you liked it! Also, if you’d like to comment on these pages or find any errors, please contact me as well! Good Speed, and Enjoy You Jerky!